By the middle of the fourteenth century lustre production had gone into serious decline in Iran. Two objects and a small number of inscription tiles and tombstones ranging in date from 1418 – 1560 are all the evidence of its survival prior to c. 1650. Then there appears to have been something like a renaissance, with objects decorated in lustre, becoming common once more, and the quality of workmanship often of a very high standard. Both in colour of lustre, and in design, there are major changes from earlier traditions. The bright, golden lustre now gives off a rich purple reflection, which adds to the luxurious impact of the finest pieces. 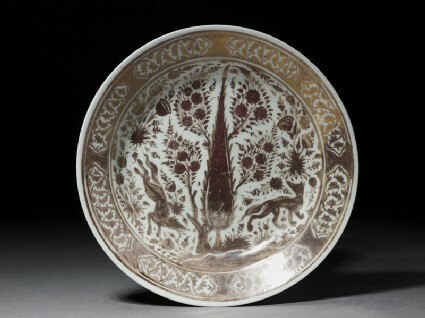 The decoration includes animals (here an antelope and two foxes), birds, cypress trees and a variety of flowers, densely painted, but in a delicate, naturalistic style. These almost certainly derive from the gold-painted, marginal illuminations of contemporary books, while the more formal arabesques in cartouches around the rim of the plate illustrated here can be imagined framing frontispieces or illustrations in such works. 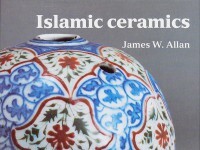 Once again we see how innovation in Islamic ceramic design was so often due to the influence of manuscript illuminators (cf. nos. 13-14 [EAX.3102 & EA1956.36]). Bequeathed by C. D. E. Fortnum, 1899.